Whether we like to admit it or not, we all like getting iTunes reviews. Podcasting is a rewarding medium for several reasons. But sometimes you can go through spells of doing a lot of work, putting a lot of quality stuff out there, and hearing nothing back about it from anyone. This is particularly true (but not exclusive) to the first 12 months of your podcast’s life. Seeing a new 4 or 5 star iTunes review is a nice reminder that people are actually listening to your show. And not just that, but they’re enjoying it too. Enjoying it enough to take a few minutes out their day to leave you a review. There’s more to it than fanning the flames of your ego, though. Reviews create social proof, and potential new listeners might decide whether to listen or not based on what others are saying about you. They also prove that your show has an engaged and loyal following. This may be picked up by iTunes themselves looking for shows to feature on their front page, or by a podcast network doing some talent spotting. So, although reviews aren’t the be all and end all, they are important. So how do you go about getting them? Who Should Review Your Show? There’s only one answer here – your audience. There are a number of ways that you can quickly get a lot of five-star reviews in a dishonest manner. You can -take part in “review swaps” in communities where everyone exchanges a 5-star rating. There are also people out there who’ll offer the opportunity to “buy reviews” (as well as snake oil) from them. Avoid these strategies at all costs. Nothing screams “dishonest review swap” like a show with a long list of 5-star reviews, on the same date, with generic titles like “Great Show!”. People can spot this a mile away. Using any form of underhand tactics to try and play iTunes also risks unwanted attention from the folks at Apple too. If you suddenly find your show removed from the iTunes store, good luck trying to track someone down to convince them to let you back in. Anyway, that’s a couple of the don’ts – what about the do’s? It seems obvious, but if you want your audience to review your show, the first step is to ask them. The best place to ask for a review is at the end of your episode. Your most engaged listeners will always listen to the very end, and they’ll be more likely to take action. Especially if they’ve enjoyed the episode they’ve just heard. The beginning of an episode isn’t a good place to ask. For starters, you’ll always have a few new listeners trying out your show for the very first time, and it isn’t the best first impression. Also, by the end of the episode, the listener will probably forget that you asked. Asking for a review at the end will always be more effective. I prefer to ask for an “honest review and rating” rather than a 5-star review. Of course, you always want a 5 star review, but it’s good to know your content alone has earned you one. Don’t labour the point, but encourage the listener to leave a rating and review by explaining the benefits to them. Things like the fact that it’ll help you reach new listeners, grow the show and enable you to keep putting out the content that they enjoy so much. Like anything else, leaving an iTunes review is simple when you know how to do it. But Apple do make you jump through a couple of hoops, and this can put someone off if they’ve never done one before. It’ll help you both if you can point your listener to a page or link on your site where you’ll walk them through the process of reviewing a podcast. You can create a video yourself, focusing on your computer or phone’s screen as you click through and review a podcast you like. Or you can use screenshots if you think that would be easier for you. Short guides showing people how to subscribe to your podcast are well worth having too. You can even link to someone else’s Youtube tutorial on rating/reviewing a podcast if you don’t want to spend any time on it. Whatever resource you choose to provide for your listener, let them know where they can find it and submit that review. Hopefully, there’s a handful of people out there who listen to your show, that you’d consider your friends. People who you know never miss an episode, and that you find yourself talking to on a regular basis. It’s absolutely not a sleazy tactic to reach out to these people and ask them if they’d mind leaving a rating and review. If they’re loyal listeners to your show then you’re still asking your audience. The chances are that they’d be more than happy to help out and support you in this way. Reading out a previous review at the end of an episode is a good way to lead into asking for reviews. It shows that other listeners value what you do, adding to the “social proof” that comes from positive reviews in general. People also like to hear their names read out on their favourite podcasts. When a host reads correspondence from a listener it helps reinforce the relationship between them and makes them feel part of that show and the community around it. So, if you’ve already had a good review on iTunes, read it out when you’re about to ask for more. It’ll help encourage others to leave one of their own, because they might end up being a part of a future episode. Is it “cheating” to hold a competition where people enter by leaving an iTunes review? That depends on where you share details of the competition. If you mention it on social media pages that aren’t directly connected to your show, then it could be considered a little underhand. Some people leaving reviews might never have listened to an episode before. This could, again, lead to the telltale signs of multiple generic “Great Show!” reviews. If you announce such a competition within an episode, though, then it’s totally all above board. You are simply asking your audience for reviews, and they’ve got the chance to win something in return. You need to make things easy for yourself when running any competition.Once the listener leaves their review, have them screenshot it and email it to you. That way you have a method of getting in touch with them, without having to guess who they are based on their iTunes name. Be clear on the closing date for choosing a winner. Is this a one-off competition or do you pick a winner at the end of each month? Is the prize digital (an ebook, course access) or physical (a bottle of wine, a book)? If it’s physical, are you in a position to post it anywhere in the world? If not, be clear on eligibility. If the prize is digital, you might consider the “prize for all” approach, so anyone who leaves you a review and then emails you will get a copy of your ebook, for example. Finally, you can offer incentives that can get your listeners working together towards a common goal. Once they get you to that milestone, you then give them what you promised. Whatever that is depends on you and your show, but it could be some form of premium content, a live episode, or an already recorded interview with a top tier guest. Or you could offer to do something a little different, like a parachute jump, having your head shaved, or running a marathon. Again, the incentive really depends on your topic and your audience. You’ll know them a lot better than I do, so pick something that’ll interest them, and set them a target. 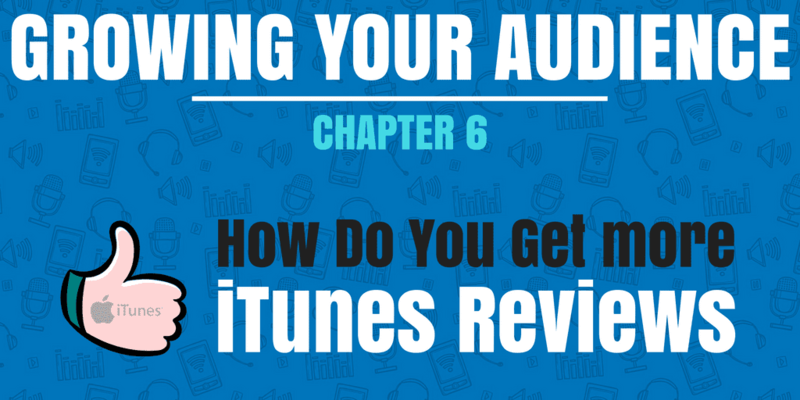 Hopefully, this has given you at least a couple of ideas towards getting more iTunes reviews from your audience. Remember, it isn’t something to obsess over, but these tactics can be employed to have multiple benefits for your show and your audience. I’d be interested to hear if you’ve tried any other methods for getting reviews? What did you do, and how did it work? Let me know in the comments section below. No seriously, great article. I’m obviously interested in increasing the amount of 5-star reviews I have but I want to do it in the most ethical honest way possible. I’ve read some articles even with a “ton of comments” that are TOTALLY bogus. “Article real good. Thanks you.” Those sort of shinanigans (sp?) turn me away from those writers forever. great article. now I know what good comments is. if the comments/review just “nice post” is it included as spam or not?